I recently went to open an audio file, and wanted to open it in an editor instead of a player. I right-clicked it, hovered over 'Open With...' and was met with a very unsightly list. I have seen a problem in the past where apps will have previous versions stuck in the /Applications folder with their version number appended, but that is not the case here. 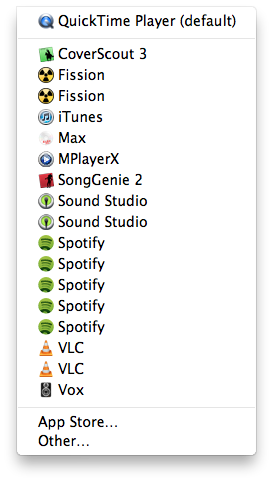 Despite the duplicity in this list, no app is duplicated in /Applications nor anywhere else I can find on my system. What causes this list to become filled with duplicates, and how can I remove them and ensure only the latest (and functional) version is list? Applications don't have to live in /Applications. If you have a clone of your system mounted, that can account for some duplicates, but certainly not what you are observing. The list of programs for Open with… is maintained in the Launch Services database. If the list contains many duplicates as yours does, the database looks like it needs rebuilding. Note that utilities like Onyx or Cocktail can also reset this database for you. Do note that Finder won't re-read the new database so you will either have to log out and in again or issue a killall Finder if you don't mind just killing it for any users on your Mac to avoid a log out and in. Then log out, and log back in again. This should rebuild the Launch Services database for OS X, removing all duplicate entries. CleanOpenWith is an application I created to clean the Open With… menu. Restarting Finder does not require you to reboot your Mac. Simply press Control + Option while clicking on the Finder icon in the Dock, select Relaunch and you are set! I just had this bite me on a fairly clean, new Mountain Lion install where I had several versions of apps and I think I have a workable idea how the duplicates came about in my case. I run this Air in clamshell mode and probably pulled it while it was asleep and the launch services database didn't clean up for the apps that were mounted on my external drive connected to my cinema display. I've run into the issue where there are backups of my apps on an external drive. If I have those drives indexed or launched apps from those drivers, then they show up in the list. I know this is an old thread, but for me, what cleared this up was going to "Force Quit" and then relaunching the Finder. Problem occurred on a 3 day old iMac totally up to date. Not the answer you're looking for? Browse other questions tagged macos mountain-lion . How do I fix duplicate 'Open with…' options? How do I remove specific items from my “Open With…” menu in High Sierra? How do I prevent 'Open with…' showing multiples of same app? How can I remove apps from my Default Browsers list and Safari's “Open Page With” menu? How to change the list of file types which Safari will open immediately after download? Can MacFusion be used under Mountain Lion? How to get a complete list of all applications installed? How do I change my “Recommended Applications” list (shown after right click > open with) for a given file extension?